There is a wonderful old legend that on the seventh day, after God created the heavens and the Earth, He chose - as any great artist would do - to sign His handiwork. Sticking His finger into the common clay of earth, He quickly signed his name... which is now known as the Grand Canyon. 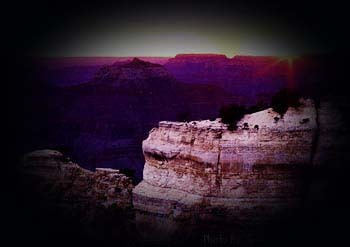 It is projected that there are about 5 million visitors to the Grand Canyon each year. Of those 5 million, only 5% (approximately 250,000) actually venture down into the Canyon. Of those 250,000, only 10% (approximately 25,000) reach the Lower Gorge/Canyon Floor - and Lee Hoedl and Chuck Fabijanic were 2 of those 25,000 persons in 2002. 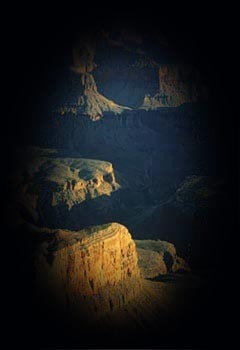 17.0 Miles Round Trip; Each individual step into the Grand Canyon takes one back in time by 60,000 years!